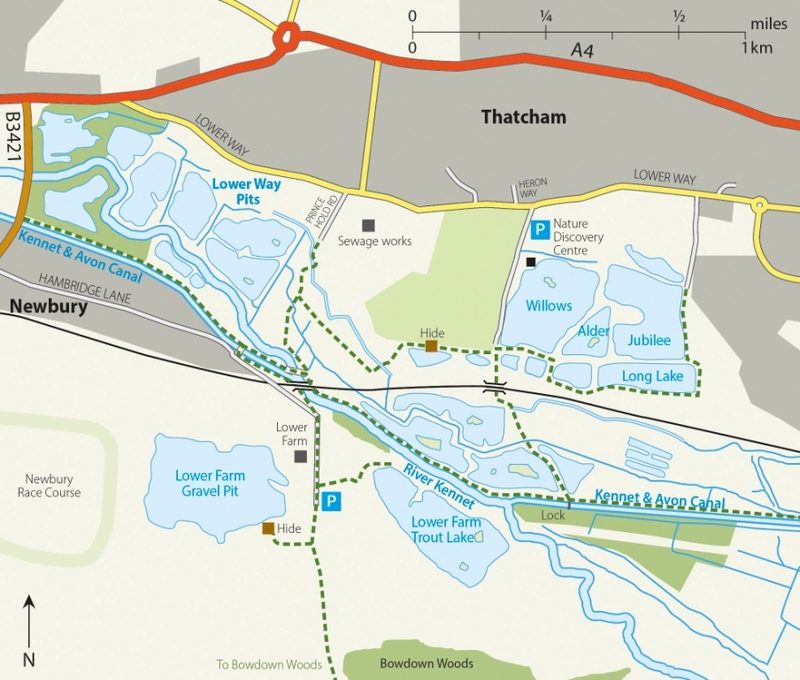 Thatcham Reedbeds is one of the largest areas of reedbed in southern England. The reed and scrub is occupied by Reed and Sedge Warblers in summer, and Reed Buntings, Cetti’s Warblers and Water Rails throughout the year. The Nature Discovery Centre hosts a number of organised events for all the family. In summer, the lake in front of the centre has displaying Great Crested Grebes, a raft for breeding Common Terns and an artificial Sand Martin bank, and may hold late-staying Gadwall or Pochard. In winter the usual wintering wildfowl can be found and Red-crested Pochard may be found at any time of year. South of the Kennet and Avon canal is Lower Farm Gravel Pit, with a hide managed by the Newbury District Ornithological Society. It attracts a wide range of passage waders and, though still rare, Great White Egret and Spoonbill are more frequent here than elsewhere in Berkshire. Access: The Discovery Centre car park is off Lower Way (SU 505 672). The path to the hide at Lower Farm can also be reached from the eastern end of Hambridge Lane. Facilities: toilets and café at the Nature Centre during opening hours. Hide at Lower Farm Lake (SU 498 662). Resident: Thatcham Marsh: Red-crested Pochard can be present all year, Little and Great Crested Grebes, Sparrowhawk, Kestrel, Kingfisher, Grey Wagtail, Cetti’s Warbler. Summer: At Thatcham Marsh most of the common warblers breed and occasionally Grasshopper Warbler; Cuckoo and Hobby are frequently seen. At Lower Farm, both Ringed and Little Ringed Plover may be seen. Winter: Large flocks of Lapwing and Golden Plover possible at Lower Farm, along with wintering wildfowl. Spring/Autumn Wader passage at Lower Farm may include Dunlin, Oystercatcher, Greenshank, Green and Common Sandpiper, Black-tailed Godwit and Curlew. At Thatcham Marsh, hirundines and Sedge and Reed Warblers and Whitethroat pass through in good numbers. Photos: Cetti’s Warbler, Dave Rimes; Spoonbill, Marek Walford; Reedbed, Robert Still.